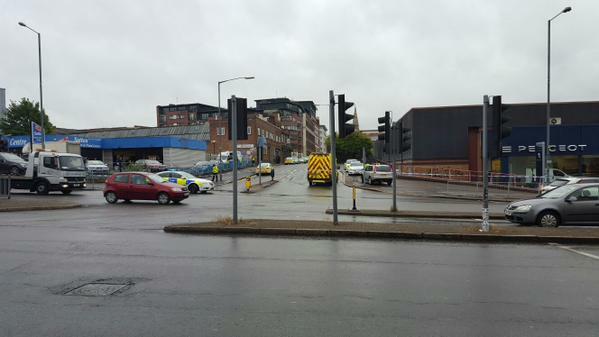 The latest on the hostage situation at a charity in Digbeth. 20.27 @WMPolice The man, who is unconnected to the charity, entered the building around 3pm unarmed. @WMPolice It is unclear at this stage what his motives for holding the two women were. @WMPolice Both women are receiving appropriate support after their ordeal. @WMPolice A man has been arrested after two women were held hostage at a charity in Digbeth this afternoon. @WMPolice A cordon is still in place while officers conduct their enquiries. 20.01 Reports a woman has been released from the building. 18.30 Wedding guests at the Spotted Dog pub led out by police to beyond the cordon. "Police were called to a charity on Alcester Road shortly after 3pm this afternoon to reports of a man who has locked himself and two members of staff into a private area. Emergency services are at scene." 17.40 Capital speaks to eye witness David Barnes who says one witness told him there was a man with a gun. The street has been cordoned off. He lives nearby and told Capital he had been walking home from work when he'd seen armed police. He said: "Someone told me they'd seen a man go into the BITa Pathways mental health charity with a gun."